Bus shelter, cool, cloudy Thursday morning. 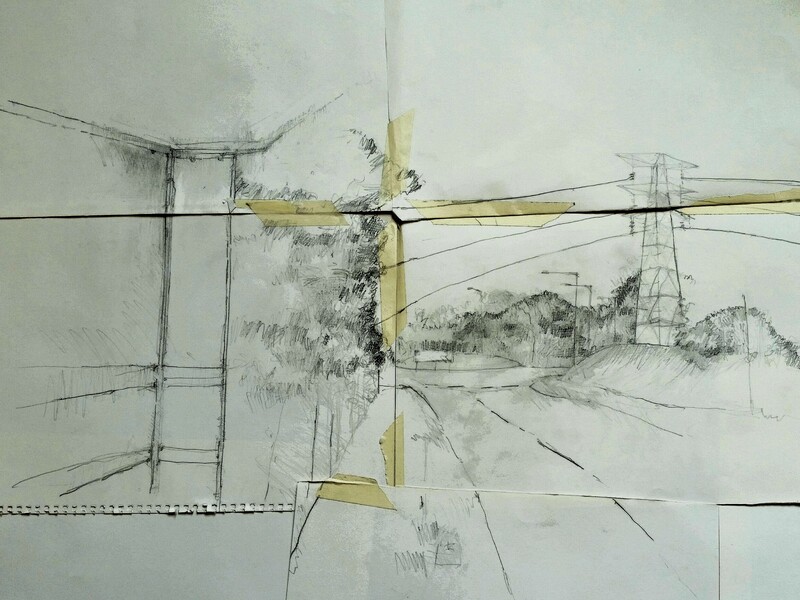 The air is ruffled by passing lorries so I hastily stick down my drawing. Three little girls all dressed in pink. A boy stares at the drawing critically for a long time and walks on. Meet a woman from Edinburgh. She fell in love and had moved to Monifieth. Her son was doing a PhD in Patent Law. Number 15 buses every 10 minutes into the city centre. They stop, thinking I want to get on and I point to the paper stuck on the bus shelter walls. I smile apologetically. Man on a skateboard, dogs and bikes along the burn. Graffiti under the bridge.